We provide a best in class e-procurement platform, complimented by our industry-leading implementation service and support. ProcurePort’s experienced team delivers comprehensive implementation support and strategic guidance; allowing our clients to truly adopt our best in class e-procurement platform, set the right priorities, quickly initiate meaningful change and continuously improve their procurement processes. ProcurePort has processed billions in spend, continuously working with global suppliers. Automate the process of collecting supplier information and quotes. Side-by-Side response comparisons with scorecards. Save 18% to 40% on addressable spend by implementing reverse auction technology. Easy to implement cloud hosted software. Automate your purchasing process. From requisition to receiving and inventory management, ProcurePort automates it all. ProcurePort provides a simple, powerful and secure contract management software solution that is easy to implement. Our platform delivers real world solutions. Read how enterprises from many industries are using ProcurePort to streamline their purchasing process. Our strategic sourcing solution is extremely user-friendly, making it simple for your organization to truly adopt it. Out of the box, ProcurePort provides options to run basic to highly complex electronic sourcing events. If that’s not enough, our team can further customize your procurement management system based on your requirements. Integrating our e-Sourcing solution with any third party ERP is incredibly easy, using our web APIs. Our e-procurement software support team is always available to ensure that your team can get the job done, no matter the situation. "I wanted to take a moment to commend your team on creating an on-line auction portal that is intuitive, easy to use, and well received by the supplier base. The ProcurePort software is so much better than the Ariba mess that we were previously using. Thanks again for making something that is easy to use and works." Purchasing and Materials Manager Doncasters - Certified Alloy Products, Inc.
"At Filtration Group the Procureport RFX and Spend Analysis solutions are a great fit. We have a lean central procurement team and these tools allowed us to quickly ramp up, understand our spend and execute sourcing events quickly. The tools were flexible and did not require IT infrastructure changes. The Procureport team has been responsive and provided good insight on how to best utilize the tools. Within the relatively low investment required these tools generated 10X payback after our first sourcing event. Overall we are very satisfied with the tools and we are working to roll them out more broadly." "T&M ran their first auction on the ProcurePort platform. It was a great success. The Bidders found the platform very user friendly, as well as easy to understand & really liked the T&M touches you added to our site. The Auction went extremely smoothly & we were able to sign a contract & save our Client a substantial amount of money." Chat with one of our e-procurement software experts to discuss how we can help you automate your procurement process. 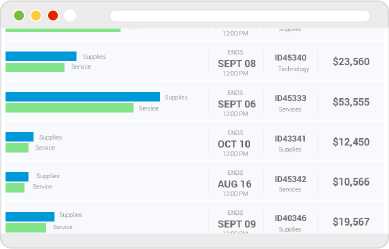 It's easy to implement your cloud-hosted sourcing solution with ProcurePort.